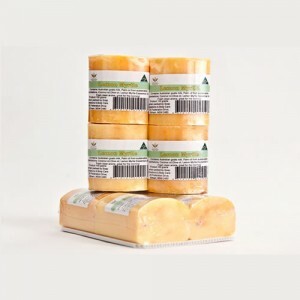 The pack contains 4 X 100 Gram bars of Honeysuckle & Lily. The bars are all separately shrink wrapped and labelled, then wrapped again in another shrink wrap to keep then together. Each Pack costs just $16 plus postage at $7.50 excellent value. The bars will each last approximately 4 weeks per person with normal use, and that enjoying a shower every day. All the ingredients are exactly the same as in the 124 gram bars. These packs make a great gift, or perfect for yourself if you prefer a smaller size to our standard 124 gram bars. The pack contains 4 X 100 Gram bars of Lavender Blue. The bars are all separately shrink wrapped and labelled, then wrapped again in another shrink wrap to keep then together. The pack contains 4 X 100 Gram bars of Lemon Myrtle. The bars are all separately shrink wrapped and labelled, then wrapped again in another shrink wrap to keep then together. The pack contains 4 X 100 Gram bars 2 of Lemon Myrtle and 2 of Lavender Blue. The bars are all separately shrink wrapped and labelled, then wrapped again in another shrink wrap to keep then together. 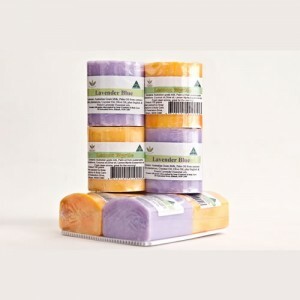 The pack contains 4 X 100 Gram bars 2 of Lemon Myrtle and 2 of Patchouli Rose. The bars are all separately shrink wrapped and labelled, then wrapped again in another shrink wrap to keep then together. The pack contains 4 X 100 Gram bars 1 Naturally, 1 Lemon Myrtle, 1 Lavender and 1 Jasmine. The bars are all separately shrink wrapped and labelled, then wrapped again in another shrink wrap to keep then together. The pack contains 4 X 100 Gram bars of Naturally. The bars are all separately shrink wrapped and labelled, then wrapped again in another shrink wrap to keep then together. The pack contains 4 X 100 Gram bars of Patchouli Rose. The bars are all separately shrink wrapped and labelled, then wrapped again in another shrink wrap to keep then together. Note: if ordering more than 1 pack, or other products with a pack, each pack counts as 3 standard size bars when calculating postage.